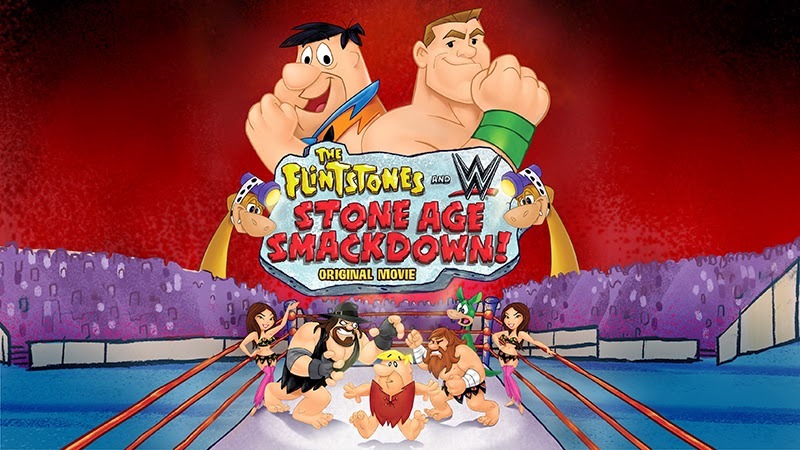 One of the zaniest tag team combinations I've heard of hit home video libraries this month with the blu-ray/dvd release of The Flintstones and WWE Stone Age Smackdown. Are you ready to Rubble! Because Fred's throwing his best buddy Barney into the wrestling ring to take on the likes of John Cenastone (John Cena), Rey Mysteriopal (Rey Mysterio) and even The Undertaker. A Geek Daddy Blog is providing one lucky reader ring side seats to view the action by giving away a blu-ray/dvd combo of the movie. To win the prize take the quiz below and tell us which Flintstones & WWE Stone Age Smack Down star YOU are. EMAIL (1 ENTRY) - Email thegeekdaddy [at] yahoo [dot] com with your name, mailing address with subject line READY TO RUBBLE. While you are waiting to see if you've won the flick, enjoy having your kiddos play with these paper dolls acting out their own Rubble Rumble between The Flintstone's Barney and Fred. You must be a US resident to enter over the age of 18. A Geek Daddy Blog will select a random winner on Monday, March 23, 2015 ( 1 winner will be selected from a random draw of all eligible entries - each submitted entry will be assigned a number and a random number will be drawn to select a winner based upon total entries ). A Geek Daddy Blog will be responsible for selecting the winner of this contest, but Warner Home Video is responsible for fulfillment and delivery of the prize. By participating in this contest you waive any liability towards A Geek Daddy Blog or its publisher that may arise from your involvement with this promotion. A Geek Daddy Blog hosted this contest and blog post based upon Warner Home Video providing the prize to the selected winner. Only one entrant per mailing address per giveaway. If you have won the same prize on another blog, you will not be eligible to win again. Winner is subject to eligibility verification. Prize will be delivered by UPS or FedEx so no P.O. Boxes are allowed as mailing addresses. A Geek Daddy Blog is hosting this giveaway as a benefit to our readers. Information for this post was provided by Warner Home Video. A Geek Daddy Blog did not receive any financial compensation for publishing this post.